A Midsummer Night’s Dream Adapted Script is a 30-minute adapted script that has been classroom-tested with young children. The adapted script keeps the rich and playful language of the original dialogue intact. Conveniently packaged in sets of five, it is perfect for teachers wishing to stage a reading or production with their students. The font size in this specially designed student script version is larger for easy reading. As well, the pride and ownership of students having their very own bound scripts increases their commitment to literacy and the dramatic process. 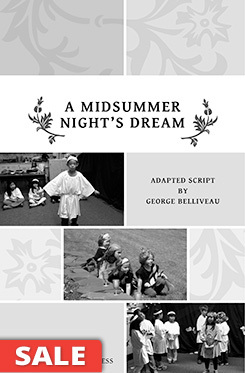 A Midsummer Night’s Dream Adapted Script accompanies Stepping into Drama: A Midsummer Night’s Dream in the Elementary Classroom, which features a series of drama lessons, a narrative version of the play, and age-appropriate production and rehearsal strategies. Dr. George Belliveau is a professor of theatre/drama education at the University of British Columbia, Canada. His scholarly and creative writing can be found in various arts-based and theatre education journals, along with chapters in edited books. He is the co-author (with Lynn Fels) of Exploring Curriculum: Performative Inquiry, Role Drama, and Learning (2008). He frequently leads drama workshops on integrating drama across the curriculum for learners of all ages.